Most of the time when you meet a Ducati 749 in the flesh it is still a pristine, airbrushed superbike virtually unwrapped from its package - the Ferrari of the bike world. But the 749 is far from a show pony. Its 116 BHP and 60 lb-ft of torque with a 414-pound dry weight is said to handle better than the flagship Ducati 999 and was available at a more accessible price point. It’s this raucous side of the 749 that Vibrazioni Art Design has channeled in their latest design. No simple cosmetic changes here – the handlebars are from a Ducati Multistrada, the swing arm from a Ducati 1098 and the forks are from a Ducati Streetfighter. 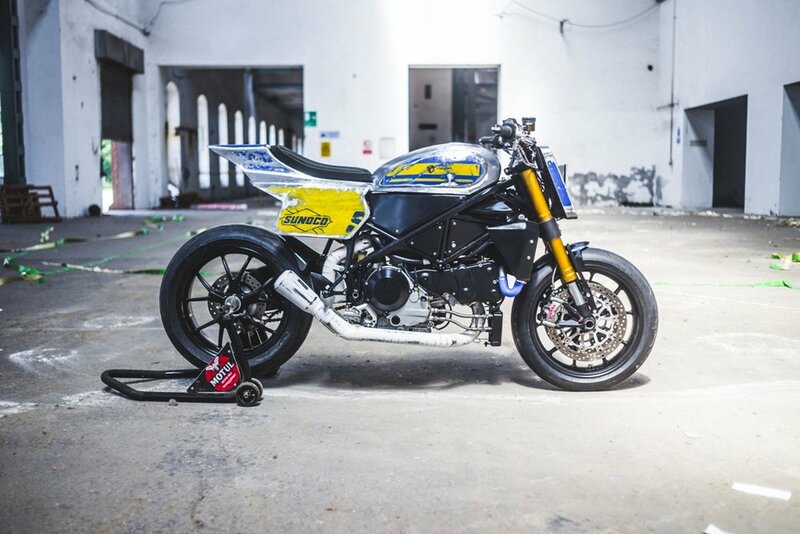 The frame has been modified to accommodate the modified Ducati Scrambler tank. Vibrazioni Art Design’s penchant for using recycled oil drums is evident here too – drums help make up the custom tank, rear bodywork, and seat and of course the vented front shield. The exhaust was made in-house and fitted with a short muffler. It all comes together to make a Ducati 749 that looks like it has been through the wars and come out stronger for it. The Vibrazioni Ducati 749 is the original 749’s evil twin; having lived a tough life away from covered garages and showroom floors it’s mean, hungry and intimidating. To see more from Vibrazioni, visit www.vibrazioniartdesign.com.